1. 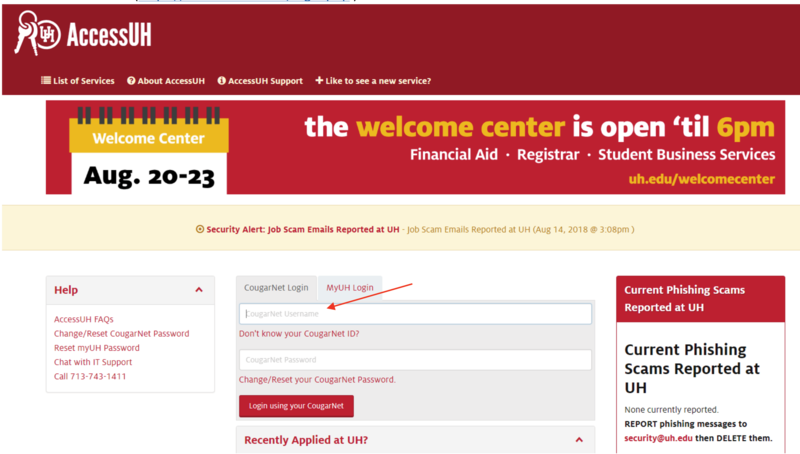 Report your Cougar Card lost by logging into your AccessUH account. 2. Click on the Cougar Card icon. 3. 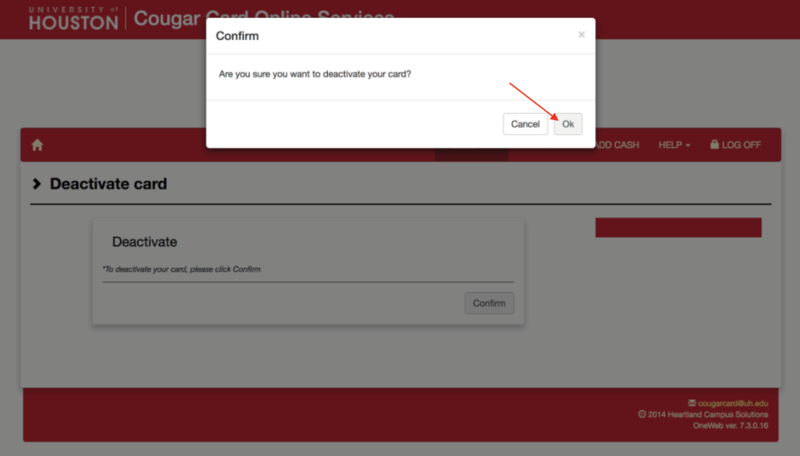 Under the Account drop down menu, select Deactivate Card. A message will appear asking you to confirm your deactivation request. Click Confirm. 4. An additional message will appear asking you to again confirm your deactivation request. Click Ok.
5. A confirmation message will appear to let you know that your request was submitted successfully. 6. If after normal business hours (M-F, 8a.m. to 5p.m. 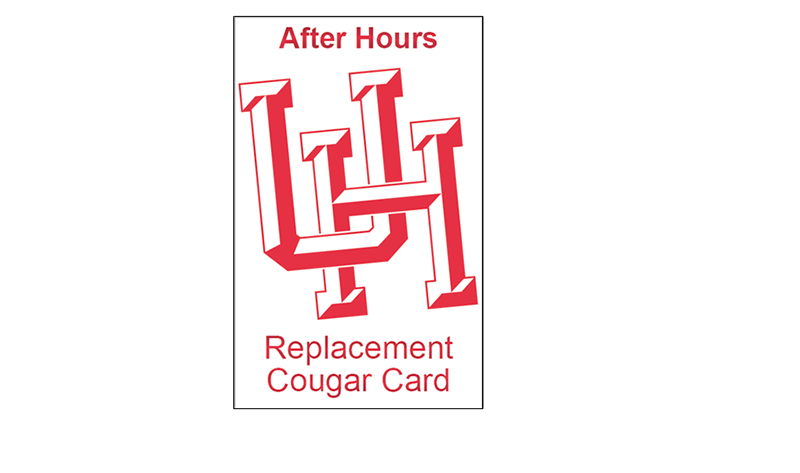 ), visit the UH Police Department located at 4051 Wheeler Ave. to obtain a temporary After Hours Replacement Cougar Card. 7. 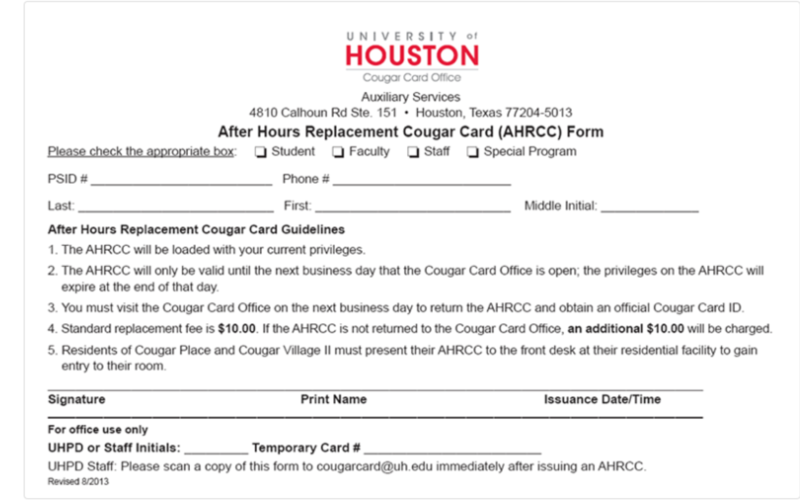 Complete the AHRCC agreement form to assist UHPD with providing you a temporary Cougar Card. Once UHPD has completed the entire process, your temporary AHRCC card will be loaded with your current building access and balances. In approximately 1 hour, building access will be granted on the new temporary card and in approximately 15 minutes, all balances (meals, cougar cash, and printing) will be granted on the new temporay card. Note: If you reside in Cougar Place or Cougar Village II you will need to visit your front desk to re-encode your temporary card for access into your individual rooms. Only the building access will be automatically granted on your temporary Cougar Card. 8. Visit the Cougar Card Office on the next business day to receive your official Cougar Card replacement.